I totally fell in love with this little coastal town; It's full of old world charm and rich in history. From the historical Newport Mansions to niche museums like the International Tennis Hall of Fame and the Audrian Auto Museum, there's something for everyone to explore. 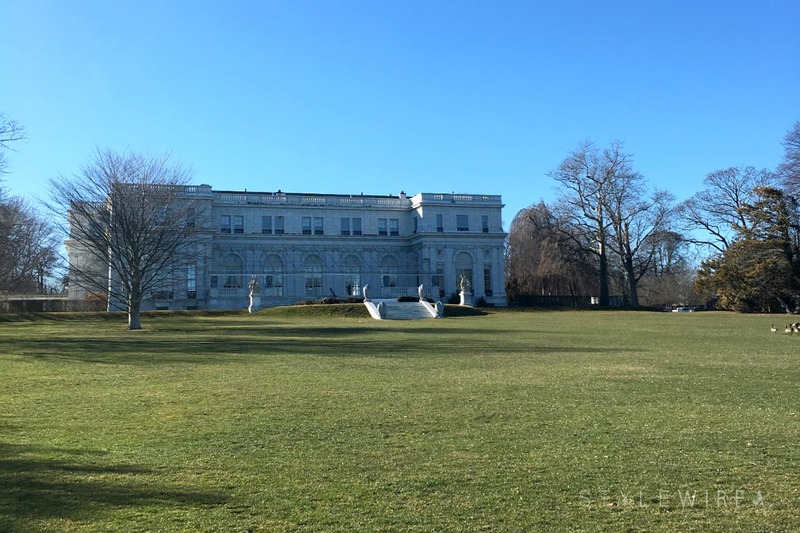 We arrived early Saturday afternoon and headed to The Breakers, the largest of the famed Newport Mansions for their new boiler room tour and a tour of the main home. You're probably thinking, "boiler room tour? Boring." But it was actually one of the most interesting tours I've been on! It's quite amazing what the early owners do the home were able to accomplish with the technology they had available, and how long those systems were in use (some until the late 1990s!). After visiting The Breakers we checked into the hotel and went in search of an early dinner. I was craving a burger so after an extensive Google search I settled on MISSION. Named one of the best burgers in Newport, it did not disappoint! While the burger was smaller than I'd have liked, the cool plastic dinosaur they gave us to mark our table was a fun touch and the mini bottles of Minionetto Prosecco eventually won me over. After we grabbed a few snacks from the grocery store and headed back to the hotel to snuggle up and catch up on my favorite shows on the giant smart TV in our room. Yet another reason I love staying at Lark, they're so hip to technology! Our room had smart TV, Apple TV, and they gave us an iPad upon check in to research and explore the area. 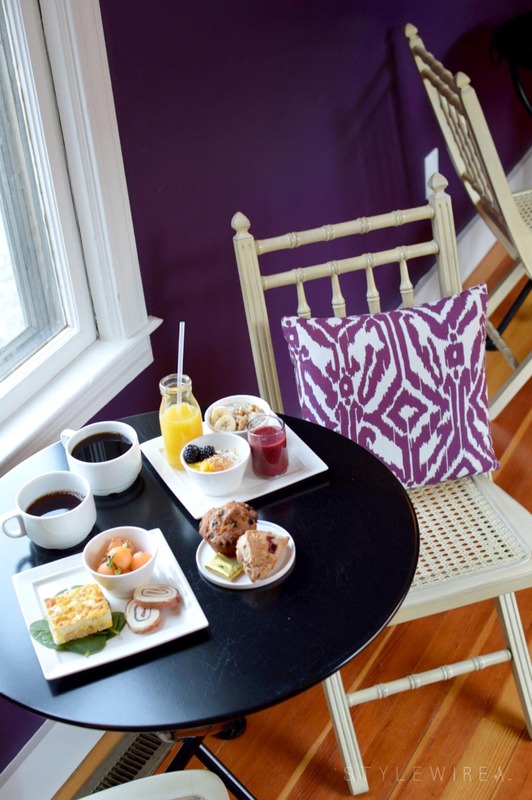 Sunday morning we woke up to a beautiful breakfast spread of breakfast greens salad, soft boiled eggs, overnight oats, pastries, and an assortment of juices and coffee. Did I mention I loveeee Lark breakfast? I'm always so inspired after leaving the table! So much so, I recreated the breakfast salad they served us with kiwi, grapes, green apples, spinach, and mint. After breakfast we took a few photos around the property and then headed to explore the Cliff Walk and into town to explore some of the shops. 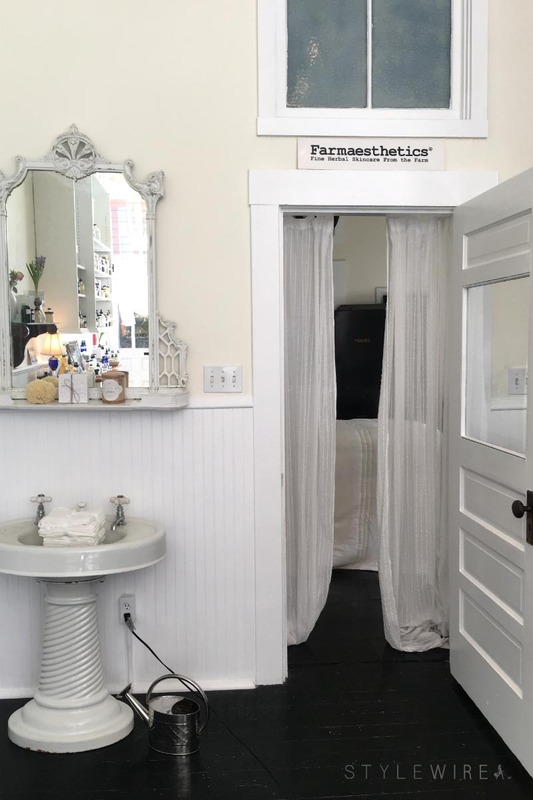 If you're traveling during the off-season like I was, you'll find that many of the shops are seasonal or closed on Sunday and Monday which was such a bummer, but I did happen upon Farmesthetics, an all natural skin care brand and spa in the heart of Newport. I loved the vibe and decor of the shop and was excited to learn their products are available at Follain in the Boston area. We wandered around Bellevue Avenue for a bit before deciding to hit one of the museums. We only had about an hour until both the International Tennis Hall of Fame and the Audrian Auto Museum were closing so we had to pick one. I'll never know what we missed out on at the Tennis Hall of Fame but I think the Audrian was the right choice! We happened to be there on the last day of the current exhibit, so we had the rare pleasure of watching them remove the vintage vehicles. All of the vehicles are in operational condition and many of them were to be driven directly to their warehouse! The most valuable, rare cars are simply placed in neutral and rolled onto a trailer so as not to increase their mileage. And right before the last of the cars were rolled out, they asked me if I'd like to sit in one of the vintage Rolls Royce. Uhm, WOULD I EVER! It was certainly the highlight of the day. After resting my feet at the hotel for a bit we went out in search of dinner. Nearly everyone who we spoke to before the trip highly recommended Diego's and I had a killer craving for enchiladas so we ventured to the wharf. There was a bit of a wait so we killed some time at the arcade and it was so much fun paying video games, trying to compete with each other in air hockey, racing games, and skee ball. I redeemed the tickets we won for a mood ring and a bunch of candy, of course. Then it was off to dinner! Diego's was great and their off season specials are even better. I was tempted by the Sunday special for two but really had my heart set on those enchiladas! 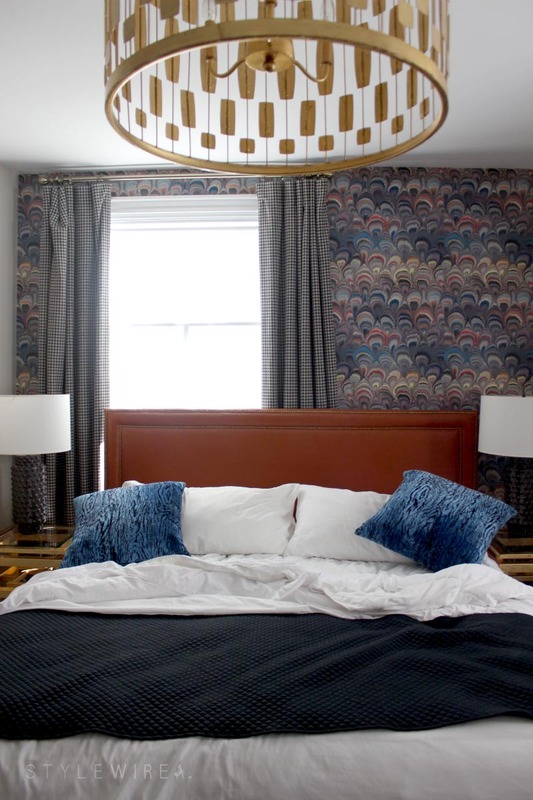 Once dinner was over, it was one last sleep at Gilded, one more delightful breakfast, and back on the road to the bean-- and straight to work at 1p.m. later that day! I loved driving this 2017 Mazda3 on our trip; it was a smooth ride the whole way, had amazing fuel efficiency, and I'm seriously consider purchasing one for myself when the time comes. A quick trip but I absolutely loved this little off-season visit to Newport! 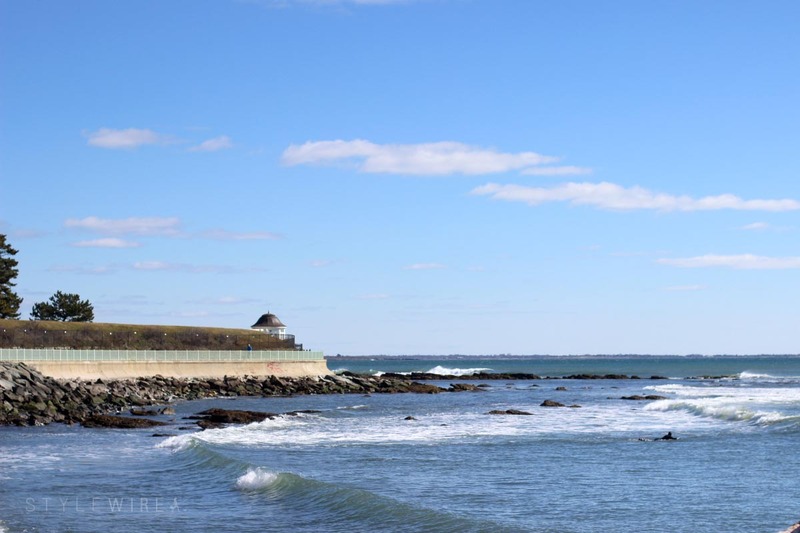 If you're thinking about visiting check out Discover Newport for the latest happenings in town! Special thanks to Lark Hotels and Gilded Newport for hosting myself and my guest for our Newport Weekend! All content and opinions expressed are my own. Thanks for supporting those who support Style-Wire.com!